Cartobibliography - Jimmy L. Bryan Jr.
Ensign and Thayer, Ornamental Map of the United States (1848). Detail. David Rumsey Collection. See below for link. A list of maps referenced in the article "Unquestionable Geographies" published in the Pacific Historical Review (Fall 2018). Page numbers refer to the PHR article. Click on the thumbnail to access full-color, high-resolution scans made available by the Library of Congress, the David Rumsey Map Collection, the University of Texas at Arlington Library Special Collections, and other repositories. Author not known (1846). The Proper Geographical Position of America in the World. Front page New York Herald, September 28, 1846. Library of Congress (pp. 631-633). Figure 12 in the PHR article digitally enhanced from the original. The story that accompanies the map appears on page 2 of the NYH issue. Bonneville, Benjamin L. E. (1837). Map of the Territory West of the Rocky Mountains. Engraved by S. Stiles (Philadelphia: Carey, Lea, and Blanchard). Library of Congress (p. 618). Bradford, Thomas G. (1838). North America (Boston: Weeks, Jordan, and Company). David Rumsey Collection (p. 615). Burgess, Daniel (1839). Map of the United States and Texas. Engraved by Stiles, Sherman & Smith ([Hartford]: Daniel Burgess & Co.). Birmingham Public Library. High resolution not available (p. 622). Burr, David H. (1835). Oregon Territory (New York: D. S. Stone). David Rumsey Collection (p. 611). Burr, David H. (1839). Map of the United States of North America. (London, UK: J. Arrowsmith). Library of Congress (pp. 618-620). Carey, Mathew (1814). A New and Accurate Map of North America (Philadelphia: Mathew Carey). David Rumsey Collection (p. 612). Carey, Mathew (1814). Missouri Territory formerly Louisiana. Engraved by Bower (Philadelphia: Mathew Carey). David Rumsey Collection (p. 612). Catlin, George (1842). Outline Map of Indian Localities in 1833. From Catlin's Letters and Notes of the Manners, Customs, and Condition of the North American Indians (Fourth Edition, New York: Wiley and Putnam), vol. 1 frontispiece. Link opens a jpeg file (p. 603). Chapin, William and J. B. Taylor (1846). Chapin's Ornamental Map of the United States. Engraved by J. B. Taylor and H. F. Wheeler (New York: Chapin & Taylor). David Rumsey Collection (p. 633). Churchman, Joseph (1833). Eagle Map of the United States. Engraved by I. W. Moore (Philadelphia: E. L. Carey and A. Hart). Library of Congress (pp. 596-598, 631). Clark, William (1814). A Map of Lewis and Clark's Track. Engraved by Samuel Lewis and Samuel Harrison (Philadelphia: Bradford and Innskeep). Library of Congress (pp. 596, 600). Emory, William H. (1844). Map of Texas and the Countries Adjacent. (Washington, D.C.: U.S. Senate). Library of Congress (pp. 622-624, 629-630). Ensign, Edward H., and Horace Thayer (1848). Ornamental Map of the United States (New York: Chapin & Taylor). David Rumsey Collection (p. 635-636). Farnham, Thomas J. (1844, 1845). Map of the Californias. From Farnham's Travels in the Californias, and Scenes in the Pacific Ocean (New York: Saxton and Miles). Link opens a jpeg file (p. 625). Finley, Anthony (1826). Map of North America (Philadelphia: Anthony Finley). Engraved by D. H. Vance. Library of Congress (pp. 611, 615). Grigg, John (1830). United States. (Philadelphia: John Grigg). David Rumsey Collection (pp. 611,615 ). Haven, John (1846). Map of the United States. (New York: Haven & Emerson). David Rumsey Collection (p. 633-634). Hood, Washington (1838). Map of the Unites States Territory of Oregon West of the Rocky Mountains. (Washington, D.C.: U.S. Senate). Library of Congress (pp. 622-624). Hunt, Richard S., and Jesse F. Randel (1839). Map of Texas. Engraved by Stiles, Sherman & Smith (New York: J. H. Colton & Co.). The University of Texas at Arlington Libraries Special Collections (pp. 620-621). Long, Stephen H. (1822-1823). Country Drained by the Mississippi-Western Section ([Philadelphia]: Young & Delleker). Library of Congress (p. 596). McGillivray, Simon (1817). A Map of America in Notice Respecting the Boundary between His Majesty's Possessions in North America and the United States (London: B M'Millan). The University of British Columbia. Scroll to the last page for map image. (p. 611). Melish, John (1816). A Map of the United States with the Contiguous British and Spanish Possessions. Engraved by Henry S. Tanner and John Vallance (Philadelphia: John Melish). Library of Congress (pp. 605-608). Mitchell, S. Augustus (1839). A Map of North America and Texas. Engraved by W. Williams (Philadelphia: Thomas, Cowperthwait & Co.). David Rumsey Collection (p. 622). Mitchell, S. Augustus (1846). 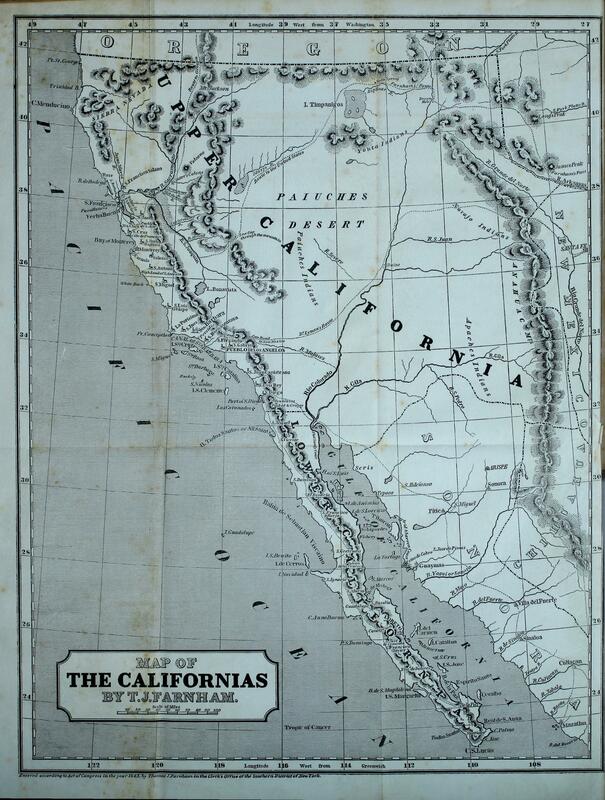 A New Map of Texas, Oregon, and California. (Philadelphia: S. Augustus Mitchell). Library of Congress (pp. 626-627, 630). Pike, Zebulon M. (1810). A Chart of the Internal Part of Louisiana. Engraved by Anthony Nau (Philadelphia: s. n.). Library of Congress (p. 600). Robinson, John H. (1819). 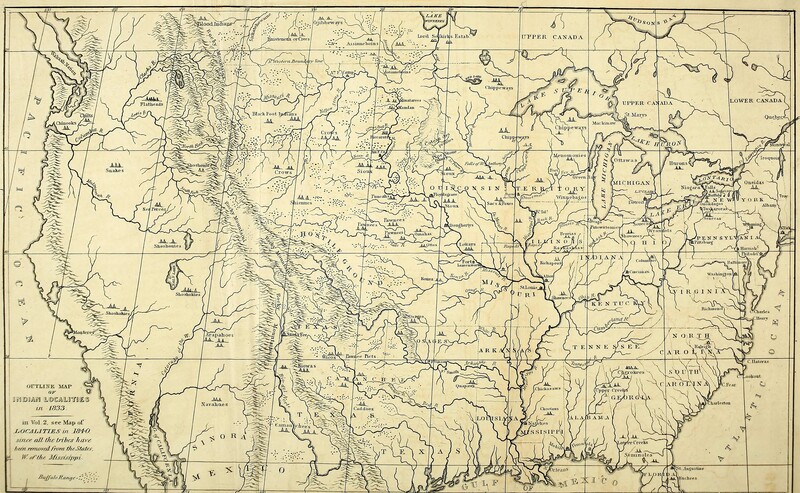 A Map of Mexico, Louisiana, and the Missouri Territory (Philadelphia: John L. Narstin). The University of Texas at Arlington Libraries Special Collections (p. 629). Sage, Rufus B. (1846). A Map of Oregon, California, New Mexico and N.W. Texas. Lithography by F. Michelin (Philadelphia: Carey & Hart). David Rumsey Collection (p. 625). Tanner, Henry S. (1823). A Map of North America. Engraved by William Duffee (Philadelphia: H. S. Tanner). David Rumsey Collection (pp. 613-614, 617). Tanner, Henry S. (1825). A Map of North America . . . Improved to 1825. Engraved by William Duffee (Philadelphia: H. S. Tanner). David Rumsey Collection (p. 615-616). Wilkes, Charles (1841, 1845). Map of the Oregon Territory. Engraved by J. H. Young and Sherman and Smith (Philadelphia: Lea & Blanchard). Library of Congress (pp. 616, 624).